The writing profession has a history of being associated with drinking. A number of authors, including Ernest Hemingway, David Foster Wallace, Edgar Allan Poe, and Truman Capote were infamous for being heavy drinkers, and Hemingway even recommended it as a writing technique. 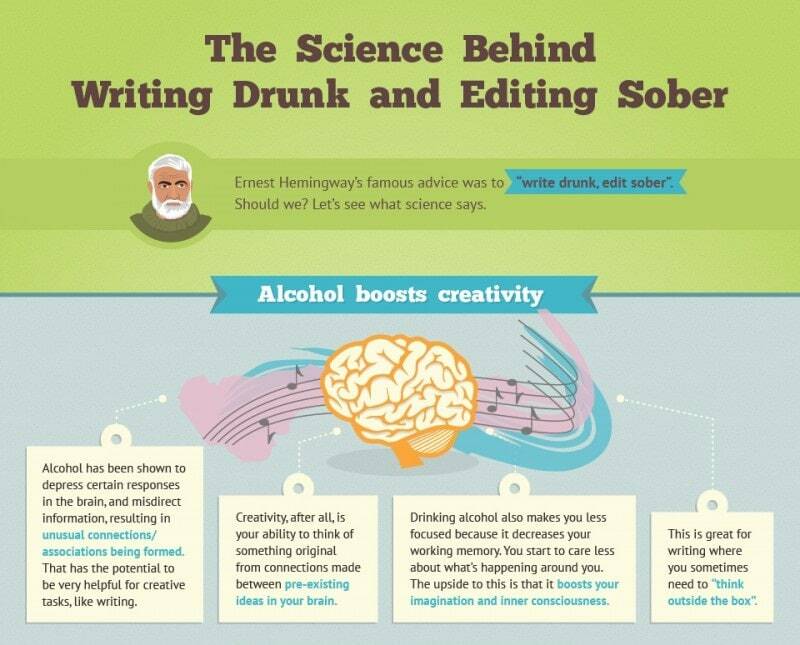 The following infographic explains how alcohol supposedly enhances creativity, and it gives tips on just how much to alcohol to imbibe to get the creative juices flowing without going overboard, as well as why coffee is the best drink for editing. I don't drink myself so I can't comment on the effectiveness, but I think the best way to write drunk would be to combine the idea with a standing desk. That way, if you're too drunk to stand then you know you're also too drunk to write. The problem with developing a habit of drinking to assist your writing is that most famous hard drinking writers’ work declines as they get older and in many cases their lives end tragically (or pathetically) in part due to alcoholism. Alcohol is just really bad for your body. Younger bodies can put up with it more, but using it as a professional habit is going to catch up with you as you age. You will also then have to confront the issue of whether your success and talent require drinking, which is not the thing you want to be worrying about as your body falls apart when you get older (sped up by drinking). There are other more healthy habits that one can develop to assist getting into a writing mood, such as taking a walk. Much of it is a placebo effect. If you train yourself to believe that something helps you write, odds are it will. I recommend developing a habit to believe that Chrysanthemum tea will help you write.